One, Two, Three, Four, Five. 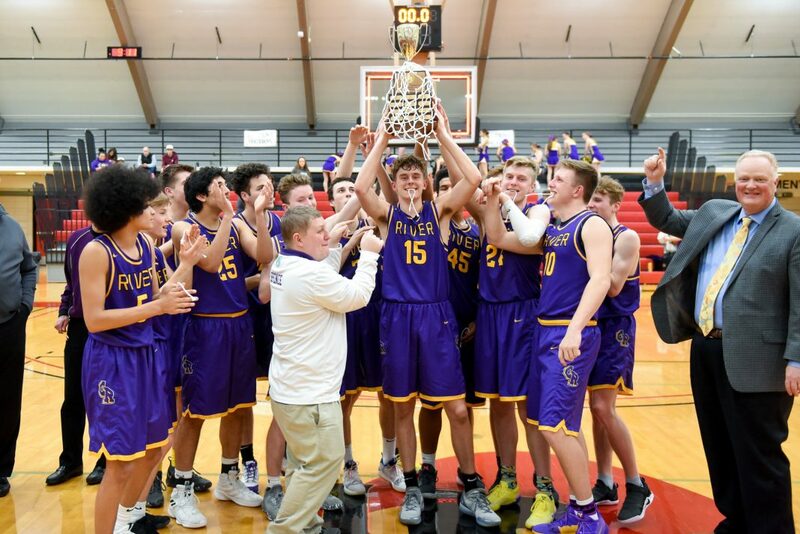 Columbia River High School of Vancouver scored five straight three pointers on their first five possessions to set a pattern of precision and dominance Friday night, February 15, 2019 at the Saint Martin’s Pavilion. The Chieftains outscored the Wolves 22-3 in the second quarter on their way to easily defeating the Black Hills High School boys basketball team 75-40 in 2A District Four play. Both teams will move on to Regional State play this weekend after the WIAA uses the RPI (Ratings Percentage Index) to seed teams this week. Columbia River (21-2, RPI 2, GSHL 2A champions) senior guard Evan Dirksen led all players with 32 points. All together the Chieftains scored 12 three pointers as a team. Black Hills (14-9, RPI 23, EVCO 2A champions,) was led by senior Jackson Bauer who had 12 points. The Wolves were not able to overcome the superior play from the Chieftains. Black Hills secured a state berth after a 59-53 win over Mark Morris on Thursday that advanced them to the District final. Black Hills moves onto State Regional play with two other Thurston County teams. The Wolves are joined by Capital High School’s boys team and the Lady Wolves who also earned a state seed after beating cross town rival 2A EVCO champion Tumwater 54-39 Saturday in Rochester. Capital High School’s boys team secured a state berth with a 61-39 home win over Spanaway Lake Thursday, February 14 at home. With the win the 3A SSC co-champion Cougs (19-4, RPI 11) faced 3A GSHL runner up Prairie (17-7, RPI 8) of Battle Ground, Friday in the 3A Central/Southwest District semifinal, but lost 45-47 on a missed three point shot to the eventual District champion. Capital lost again Saturday 55-52 to PCL champion Lincoln (19-4, RPI 6) of Tacoma, missing an opportunity to raise their RPI ranking before 3A Regional State seeding. Timberline’s (18-7, RPI 9) boys team, who shared the 3A SSC title with Capital, lost Saturday 49-62 to Wilson (17-9, RPI 14) in the winner to State/loser out District game in Puyallup. Timberline also lost a heartbreaker game earlier in the week Wednesday, 54-56 to Prairie at home in Lacey, sending them into the losers bracket play and denning them an automatic state berth. Thurston County boys teams from Olympia and Tenino and girls teams from Capital, North Thurston, Yelm, Timberline, Tenino and Olympia also competed this week. The lady Rams (15-9, RPI 29) narrowly missed a state berth after falling 62-55 to Hudson’s Bay (19-6, RPI 14) Saturday. The boys 4A Olympia Bears (15-9, RPI 19) started district play with a 59-36 home win against Ketnwood but also came up short after losses to Union (22-1, RPI 2) and Battle Ground (18-8, RPI 10) on their quest for a state berth. It was a bitter ending for the Bears who finished second in the tough 4A SPSL league. For the Capital boys, and both boys and girls Black Hills teams, they will have the week to recharge, rest and re-set as they play Regional State seeding games starting this weekend.